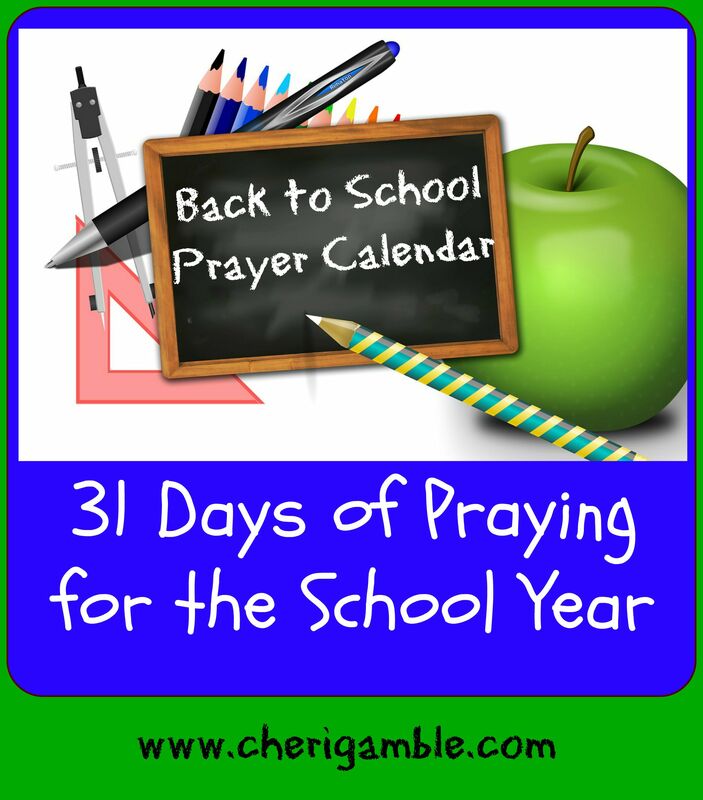 This post contains 2 prayer calendars with 31 days of specific prayer ideas for the upcoming school year. Our schools, students, teachers, and families all need our prayers as they face challenges every day. While we might not be able to pray in our schools any more, NOTHING can stop us from praying for our schools. That is why I would like to encourage everyone, even those of you who do not have students in the public school system, to print off this prayer calendar and help cover this school year in prayer. Let me speak to my fellow homeschoolers for a moment. I love homeschooling. My family is a homeschooling family. I know that homeschoolers also face challenges and that we certainly need to cover our school year in prayer. (Note: I have included a separate Back to School Calendar for you, too). However, homeschooling our own kids does not give us the excuse to forget about those kids and teachers that are in the public school system. They need our prayers. Will you print off a calendar and commit the next 31 days to praying for your local public school? Imagine the impact you could have and the lessons you could teach your children about the power of prayer! And, to my public school friends: Would you consider praying for those of us who are homeschooling, too? You can get an idea of some of the ways we could use your prayers by checking out the homeschooling calendar below. Thank you — we certainly do appreciate your prayers for our school year! Remember, God loves public school children AND homeschooled children — so let’s pray for them all as they get ready to go back to school! 1 Pray for the school board and for godly wisdom in all decisions made. 2 Pray for the administration of your local school system. 3 Pray for early elementary teachers as they interact with children and families. 4 Pray for later elementary teachers to have wisdom and patience with their students. 5 Pray for middle school teachers and the unique challenges they face. 6 Pray for high school teachers as they help prepare students for adulthood. 7 Pray for school guidance counselors to have wisdom and peace as they work with students. 8 Pray for local churches to partner with schools and influence students. 9 Pray for special education teachers and their special students. 10 Pray for cafeteria workers and for students who come from homes where food is an issue. 11 Pray for school janitors. 12 Pray for coaches and athletes – for good sportsmanship and for valuable life lessons to be learned. 13 Pray for teachers who teach students from other languages. 14 Pray for the curriculum to teach truth in all areas. 15 Pray for Christian teachers to have a boldness with fellow teachers and families. 16 Pray for the students who feel left out and lonely. 17 Pray for the students who come from violent backgrounds. 18 Pray for the students who are questioning their identity. 19 Pray for the students who come from broken families. 20 Pray for the financial situation of your local school system. 21 Pray for Christian families to have a strong influence in your school system. 22 Pray for a safe, non-violent school year. 23 Pray for substitute teachers who love and serve God. 24 Pray for the school bus drivers and aids. 25 Pray for Christian students to have boldness and to stand strong for their faith. 26 Pray for a teacher that you know by name. 27 Pray for the state board of education. 28 Pray for those who write curriculum to only write truth without political bias. 29 Pray for an interest in Biblical Christianity to spread through the schools. 30 Pray for a specific need of your local school system. 31 Pray for those who are homeschooling their children this year. 1 Pray for your family relationships to grow this year. 2 Pray for a relaxed, unrushed feeling to your school day. 3 Pray for solid academic growth. 4 Pray for open communication and honest conversations. 5 Pray for patience with your children when they struggle. 6 Pray for your children to develop a life-long love for learning. 7 Pray for the extra activities that your children are involved in. 8 Pray for your children to make strong, encouraging friendships. 9 Pray for your family to be a strong witness in your community. 10 Pray for you to resist the temptation to compare your children with others. 11 Pray for a peaceful home throughout the school year. 12 Pray for fun days and great memories with your children this year. 13 Pray for wisdom in the curriculum you select. 14 Pray for your child to recognize and embrace the benefits of homeschooling. 15 Pray for your church and your family’s church involvement. 16 Pray for your children to overcome the challenges they face this year. 17 Pray for godly attitudes for every member of your family this year. 18 Pray for your children to all make a commitment to follow Jesus wherever He leads. 19 Pray for a strong support system for you as you homeschool. 20 Pray for the energy to get up when you need to and to complete the day’s activities. 21 Pray for wisdom in selecting what activities you should do with your kids this year. 22 Pray for grace towards those who do not understand why you homeschool. 23 Pray for you and your child as you tackle arithmetic this year. 24 Pray for your language arts classes and for your children to learn to express themselves clearly and powerfully. 25 Pray for your child to develop a correct understanding of historical and current events. 26 Pray for your child to develop a love for and a biblical view of science. 27 Pray for your child to get the physical exercise he needs. 28 Pray for your child to be wise with technology. 29 Pray for your child to grow in his faith this year. 30 Pray for the area that gives you the greatest fear as a homeschooling parent. 31 Pray for your local public school. If you enjoyed the prayer calendars, be sure to check out the other prayer calendars available here on Ministry Mom. Also, check out the Bible reading plans, fun family Bible times and Bible curriculum. There are plans and curriculum available for all families — those who homeschool and those who don’t. I’d also like to invite you to join our facebook group, Raising Godly Kids, and to like my facebook page. Thanks so much! Have a great school year and KEEP PRAYING! Beautiful! And thank you for helping bridge the gap between homeschoolers and public schoolers. We’re all trying to follow God’s plan for our family and can use the prayer support no matter what option we choose! I really love this. My husband and I make a conscious effort to pray for our children and to pray for the schools. This is such an awesome idea and I can’t wait to share it with everyone I know. What a wonderful idea! I love that you included teachers, school administrators, etc. on this prayer calendar, too. 🙂 I’m stopping by from Christian Women Blog fb page.